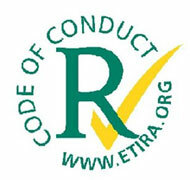 In order to guarantee our clients a high-quality, competitive and environmentally friendly product and service, ETIRA has developed a Code of Conduct for its full members. The Code represents good corporate behavior, setting out a number of general guidelines and principles adhered to by the user in his daily business. Key obligation is to refrain from trading patent-infringing newbuilt cartridges. All ETIRA members must comply with the Code to distinguish themselves in the market, and add value to their company image. Compliance with the Code by the ETIRA full member is signified by his licensed use of ETIRA’s EU-wide registered ticked-R collective mark. To ensure compliance, all new Members first need to sign a (renewable) agreement with ETIRA that they may only use the collective mark if they fully respect and comply with the Code of Conduct in their daily business. If you buy from an ETIRA member, you are buying from a respected company applying the highest industry standards.